Prime Minister Justin Trudeau, right, at the site of the Gordie Howe International Bridge Co. with Michigan Gov. Rick Snyder. 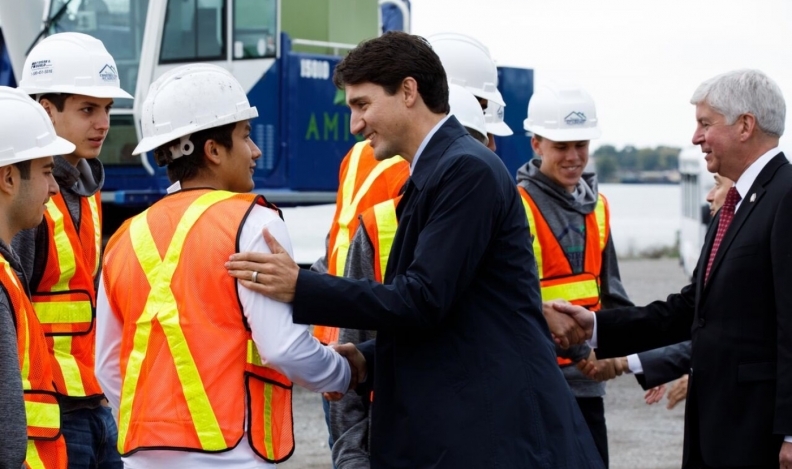 Flanked by dignitaries from both sides of the border, the prime minister said the Gordie Howe International Bridge, currently slated to cost $5.7 billion, will be built over the next six years and be ready for operation by late 2024. He made the announcement at the beginning of a jam-packed day in Windsor, Ont. He said the 2.5-kilometre bridge spanning the Detroit River will provide a critical conduit for commerce between the two countries, an issue he said has taken on increased relevance since the successful resolution of contentious free trade negotiations earlier in the week. Trudeau called the bridge “essential” to North American trade. The new bridge could help relieve a legacy of major congestion issues for automakers, suppliers and logistics companies between the United States and Canada. “The new bridge allows for significantly increased trade capacity, provides a real hedge against security and other related passage delays and further cements the Windsor-Detroit crossing’s status as the most important international trade link in the world." Roughly one-quarter of all goods traded annually between Canada and the U.S. passes through the Windsor-Detroit corridor. On Friday, the bridge received a public benediction from Michigan's Republican Gov. Rick Snyder. He also touted the long-term trade benefits, saying that one quarter of all trade passes through the Windsor-Detroit corridor while 7,000 commercial vehicles travel through the area daily. The six-lane, cable-stayed bridge — whose towers will be designed to look like a hockey stick taking a slap shot — is expected to have a lifespan of 125 years. Later on Friday, Trudeau is expected to meet with union leaders, tour a vehicle assembly plant and hand out turkeys for Thanksgiving.